I think. And so I type. Man United is playing Chelsea, and they are losing. As of first half, at the least. I think this is the first time ever I am writing a post that includes sports. I am down a couple of beers, and I am listening to a Warning Sign. When DeeDee was in his first year of college, he calls me one night, I can hear people and music in the background. We talk for a few seconds, random chatter. He then tells me he wants me to hear a song. The one that is playing in the background. And then I hear DeeDee and a couple of guys croon, "I miss you...". This is followed by laughter. And here I am, years later listening to the same song. How time flies. We are now married for nearly two years. How we have changed, but yet unchanged, really. There is actually no one who can even begin to understand how we are where we are today, DeeDee and I. We have realised that. I still remember the time when I asked him to watch the movie Once. We are so much further from those days. With every passing day, we find ourselves more "into" each other, in ways that I cannot describe. I know will not be able to. Not being narcissistic, but I do believe that what DeeDee and I have is unconventional and different, wonderfully bizarre, even. Well, we shall wait and see what the next day holds for us, eh? I once described life to this guy I was riding behind with. I told him that my life was like those minutes inside a movie theatre. Now, I had the ticket with me, I'm inside the theatre. I'm watching the movie. Waiting for it to end. Only then can I walk out. Awaiting death, I called it. Years later, I am made to realise that I still feel the same. Industrial revolution. Industrial revolution and women. Women during industrial revolution. Working women during industrial revolution. Industrial revolution mad men. Mad men commentary industrial revolution. Iconic images of women during industrial revolution. Rosie the riveter mad men. Mad men feminist book. Feminist books. Feminist book industrial revolution mad men. And voila! I finally found the title of the book I was looking for - The Feminine Mystique. My second ever assignment during editorial training, on my third day at Digicaptions was on a commentary for a Mad Men episode. The writers/producers talked about the show and the industrial revolution and women venturing out of their households and men adjusting to the change and a mention of the book - The Feminine Mystique. I once spent hours at work trying to find out which show I had transcribed that spoke about the book. And today, here I was, desperately googling for it. Not that this post is about the book. The book is just a thing that you remember which takes you back to that place, that image in your head, that moment and the thoughts you had then and the ones you consequently have over the years to come. Not housewives, home-makers, we say. Labelling the non-working married women. I do not see much difference in the two, frankly. You see so many women holding high offices, you have your mothers and aunts at responsible positions of authority, you see your neighbour having her own organic garden while she raises 2 kids, you see your female friends venturing into starting something new themselves, you see a female rickshaw driver... And you see all these women and you feel proud. Women out there, fending and earning for themselves. Respect and awe comes naturally. And then... You again see your moms and aunts in the house all day, cooking and tidying up after you and the rest of the inhabitants of the house, that distant aunt who juggles 2 whole sets of families all under one roof, your friend who got married the week after your last exam, your neighbour lady who is seen outside only to say bye to her husband and kids, and then to receive them again with a smile in the evening and you think, you think to yourself, why is that woman not doing something else with her life? We tend to see non-working women a notch (or two) below the working ones. It is true. But there is a lovely movie out there that showcases both the sides. And here is one lovely scene with Julia Roberts, the art teacher trying to get her student, Julia Stiles, enrolled into a law school, in a bid to let her ‘pursue her dreams’, instead of being married away. Watch the video and then read the transcript below. Joan Brandwyn: It's too late. Katherine Watson: No, some of them accept late admissions! Now, I was upset at first, I can tell you that. When Tommy came to me at the dance and told me he was accepted to Penn, I thought, 'Oh God, her fate is sealed! She's worked so hard, how can she throw it all away?' But then I realized you won't have to! You can bake your cake and eat it too! It's just wonderful! Joan Brandwyn: We're married. We eloped over the weekend. Turned out he was petrified of a bit ceremony, so we did a sort of spur-of-the-moment thing. Very romantic. Katherine Watson: But you don't have to choose! Joan Brandwyn: No, I have to. I want a home, I want a family! That's not something I'll sacrifice. Katherine Watson: No one's asking you to sacrifice that, Joan. I just want you to understand that you can do both. Joan's last lines sums it up. A couple of years ago, I used to ride to work on chilly mornings at 6:30 and annoy the hell out of everyone. Why? I was annoyingly happy. I loved my life in the house which I shared with a thirty something woman. She travelled a lot and was hardly there. I had the entire house for months at a time. Top floor house, it was. Nice view of the neighbourhood. Quiet and lonely up there. I had my very own room, a narrow but fully functional kitchen and the hall which had long French windows right next to the door. I remember how excited I was when I got a refrigerator and paid for it myself. It was my very own fridge. It was small and red. I made sangria. I started learning a new language. I downloaded audio lessons. I cleaned and repeated weird sounding words after the guy on the tapes. I cooked dinner. Tried my hand at new recipes. Treated myself to yummy food. I went out walking in the evenings. I remember the rains and the skies the best. Monsoon. Chilly weather. I sometimes met up with a friend or two for dinner or coffee. I remember one late evening when there was a heavy downpour and the lights went out. There was thunder. Loud. I took my veena, sat down in the hall, faced the windows and played for hours. I didn’t have a candle. Or a torch. Longest I have ever played. I was happy. But I didn’t make just sangria. I experimented with white rum. Miniatures stocked up. I had a wine bottle always tucked away in the bottom most compartment of my cupboard. My nights were a routine of having a couple of glasses with a movie or a sitcom. But I did wake up every day at 5:30, all by myself, to go work. Every single work day. All charged up to irritate people during breakfast on the top floor. Long time back, it all seems. 2013 has been a horrible year so far. Right from January. I do have French windows here as well but the view isn’t that great, and a roommate who is absent on some days. I am no longer annoyingly happy. No miniatures stocked up. They don’t help anymore. Torches. He liked to keep them handy by his pillow. His wallet filled with a wad of money notes under his pillow or the mattress. Boxes filled with biscuits and rock sugar and chivda by his beside. His phone book filled with names of people from his daughters to the cable guy. A bottle of Sprite on the stool before him. A book or two next to his pillow. He wrote letters to the Governor and the President and made us all wary. His oxygen tank and other breathing aids surrounded his bed 24/7. A few years before it was different. Slight changes. Steel boxes filled with khara mixtures and sev. Plastic ones filled with potato chips and dry pakodas. A tape-recorder for listening to the FM radio in the mornings. He used to walk around a little on the balcony outside his first floor house. His very own house. Occasionally calling out to the pan shop guy to his left or the juice guy to his right or reprimanding the college boys and dog walking uncles for smoking. A few years before this he would be seen doing a lot more. He loved getting out the hose pipe and washing the balcony and the stairs and the compound on the ground floor. He’d occasionally be seen getting into the auto with his youngest daughter. Most times to buy books. Every morning after shower there was a ritual done in the kitchen before the small mantap. Every morning without fail. A couple of years before this my most vivid memories are of him running after frogs after the rain with a bucket. I don’t see frogs now. I used to play vehicle counting games with him on the balcony while we waited for my parents to return from work. He used to smoke. And I hid his cigarette packets. He always took my side whenever my then college going Aunt told on me. He rode a Bajaj Chetak. I was 7, probably. I remember being thrilled at the fact that he okayed me to sit sideways and ride with him. I once stole 10 rupees to get a chocolate from the local milk parlor. My mother saw me with it on her way back from work. He took the blame for it. Said he had given it to me. He never questioned me about it. I never stole after. I used to head upstairs and sleep by his side. He used to make up stories for me. Suvarna Sundari - I think was the protagonist ‘princess’ character of most of his stories. He once took me to his then ‘office’. I can still picture it. A large room, barren, with a few desks and 2-3 people at them. Was it in Chamrajpet? I cannot recall. 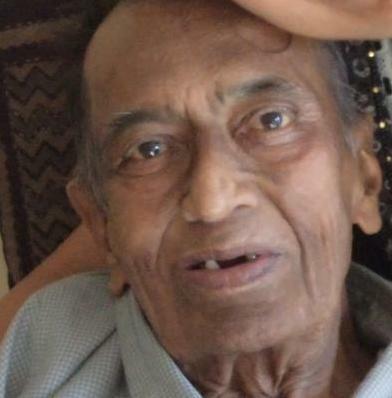 Not a spiritual or a religious person myself, he was the only one to teach me shlokas and such when I was little. I remember the black telephone with a round dialler. I remember his favourite black cane chair. He always, even the last time I met him and spoke to him, chided me for not keeping a bindi. But I was the only person with whom he was lax about it. I’d like to think I was his favourite. My Grandfather. He had his flaws. But he was one person I was never afraid of. The only person to ask me straight out if I had made love with my previous boyfriend. The only person with whom I discussed death and how I wished to be disposed off. Oh, we spoke on it pretty lengthy. He subscribed to Readers Digest and The Week. The many, many letters to RD in the hopes of winning the jackpot! He loved Clint Eastwood, Robert Redford and movies with other such actors. I remember getting in touch with a guy who did torrents of old flicks and requesting for a list my Grandfather had asked for. He read Clive Cussler, Lee Child, James Patterson, Tom Clancy, David Baldacci and a host of other authors. He prided his James Hadley Chase collection. He cooked as well. His signature dish was benDekaayi mudh-palya. It was yum every time. Over the 24 years of my life, I knew him and knew of him in stages and phases. He used to call me MS 2 - Maddi SambraNi 2. He was perceived to have weakened over his last few years, but he was strong as well. He spoke well in English and like he'd say, there is no bullshitting about it. I am the only grandchild to have known him this closely. I miss him already. I shall miss him more over the years to come. I love the above text. Kundera puts it with such clarity. He writes about two very different desires - one sexual and the other less so. The need to mate is more primal, so to speak. To share a bed with someone and to just let your eyelids close leading to a state of rest to your ever wandering mind is something else. On similar notes, being in love with someone is different from loving someone. To experience love in its various forms is when you would find yourself open to how to you truly feel about things. An intense rush of love towards someone is not the same as the joy and bliss you’d get from being in love with someone. And to be able to distinguish the two when encountered simultaneously, is when melancholy makes itself known. if you don't have to deal with the past. Dreams pave way to the thoughts of the subconscious mind. I'm a drifter in a land of no eternity. The one where we make an announcement (kinda). Its alright to let yourself go... as long as you can let yourself back.